another to implement it effectively. We train you to train them. is comprised of two distinct segments. The first is geared to help your company adapt to the complex task of conducting business online. We cover a number of topics including email, direct marketing and the new breed of customer. It can be done face-to-face on a one-to-one bases, or in small groups. It can also be designed as a complete online package or as a refresher course for anyone in your company who has attended our personal training courses. 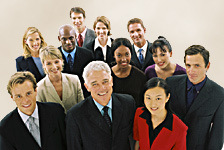 We design programs for executives as well as administrative and sales specialists. ¤ Our second style of training is designed to help your clients, customers, distributors or suppliers understand your products or services. We design and create full online programs that impart your proprietary information. For example, you may be a manufacturer with a new product line that requires modified installation procedures or maintenance programs. Our training modules incorporate sophisticated forms, video and testing functions.